Need to stretch your apps budget? 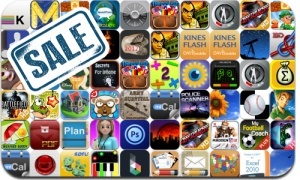 Here are 55 iPhone, iPad and iPod touch apps that just went on sale. This app deal alert includes Lep’s World 2, Swing Shot, Rebuild, Cut the Rope: Experiments, Prison Mayhem, Need for Speed Hot Pursuit, Fluke, Little Conquest, Adobe Photoshop Touch, Inspiro, iSwing Golf, and many others.